Cheetah PowerSurge is marketed as a caffeine-free source of energy with the benefits of ginseng and Royal Jelly. Royal Jelly is a creamy white substance type synthesized by the common worker bee for the sole nourishment of the Queen Bee. Feeding only on this Royal Jelly, the Queen Bee develops superior size, strength, stamina and longevity compared to other bees, and the makers of Cheetah are likely hoping that adding it to their energy drinks will result in similar benefits to their consumers. 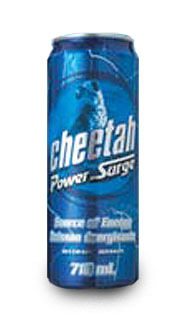 Cheetah PowerSurge comes in regular and diet versions, as well as a "High Octane" variation which has Gingko Biloba added to the formulation.